Tora, Tora, Tora was a famous film about the Japanese attack on Pearl Harbour in 1941. Last night we saw an attack on Old Trafford by Lucas Moura, who scored two of Spurs� three goals, after Harry Kane had given Spurs the lead with a superb header. Spurs have only ever won three Premier League games here, and I have been lucky enough to see all three. In their history of league meetings away to United, Spurs have only ever won 13 times, and as well as those last three I had the pleasure to witness a 1-0 in the 70s when Ralph Coates scored a solitary goal in the year United were relegated. Yet, in the first half, when a much energised (and changed) United team were clearly on top for the first half-hour, I would happily have taken a 0-0 when a typical United home win had looked on the cards. 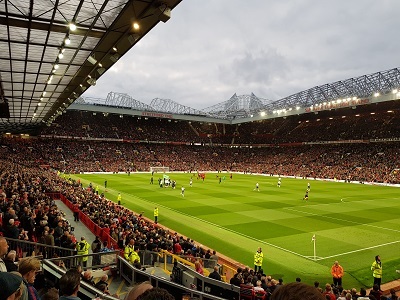 Spurs settled and closed that half well and should have had a penalty when man of the match Lucas Moura was clearly fouled by Phil Jones inside the United area at The Stretford End. Spurs started the second half in sensational fashion with two goals in two minutes and then defended magnificently until our Brazilian hero sealed the win with his second and our third goal. Despite Spurs� historic achievement the post-match headlines and discussions were all about Mourinho, who conducted a somewhat freakish press conference, and who is clearly feeling the strain. Jose (He's "not special anymore!") is desperately seeking a defence, and after last weekend�s shock defeat at Brighton he dropped his proteges Bailly and Lindelof for this one. The defence looked a desperate selection with midfielder Herrera called into a back three in which England Internationals Smalling and Jones were recalled. Valencia was back at right wing-back. Matic returned and there was no sign of Anthony Martial(not even on the bench) or Marcus Rashford. Mauricio Pochettino ("He's magic you know!") reverted to a back four and it was a pleasure to see Toby Alderweireld operating in tandem with his Belgian team-mate Jan Vertonghen. Both were supreme and are arguably the very best centre-back pairing in the Premier League. Both the other Spurs players linked with possible moves (Danny Rose, and Mousa Dembele) started. Rose had one notably dodgy moment, but �The Moose� was prominent in front of the defence. Due to an injury sustained in the warm-up Luke Amos was a late replacement on the bench for Erik Lamela. Despite his drink/drive arrest Hugo Lloris retained both his place and the captaincy, and therefore the trust and support of his manager. United kicked off and had a good chance within the first minute as they attacked the right channel with Fred putting his shot just wide. Spurs were on the back foot and United attacked in numbers with Pogba and Fred supporting Lingard and Lukaku with the wing-backs to the fore too. Heroics were required by Jan Vertonghen twice with successful challenges on both Pogba then twice winning against another Belgian team-mate Romelu Lukaku. Danny Rose made a near catastrophic back pass after 15 minutes, letting in Lukaku, who rounded Lloris but fired wide across the open goal. It was a costly miss and a turning point in the game. Shaw advanced three minutes later down the left for United and passed inside to Lukaku, but the striker�s shot was weak and easily held by Lloris. Spurs did not seem to be getting much change out of referee Craig Pawson, but it was a United player who went in the book for a foul on Lucas Moura, who had already been booked himself for a foul on Jones. The ball came back from Spurs� free kick and Valencia had a shot which was well off the target. United were hesitant in clearing their lines after 24 minutes, and Dele Alli seized upon the ball and got into the box into a shooting position before the ball was cleared off his feet. Spurs were now getting a foothold in the game and after a quickly taken free kick near the halfway line, Lucas Moura made a beeline for the United area and was shoved inside the box by Jones. The referee was not interested. Fred had a shot go wide from the right side of the Spurs area and there was trouble for Spurs after 33 minutes when Lloris saved from Pogba then Matic put Valencia�s cross wide, although United had won a corner. Spurs had a chance after 39 minutes after Vertonghen lifted the ball into the area; Kane challenged but Lucas Moura fed the ball back to Eriksen, whose shot was held by the United keeper. Kiernan Trippier hit a deep cross into the area and Dele was at the back post, about to pull the trigger before Herrera intervened. Kane and Dele combined cleverly inside the United area and both Lucas Moura and Eriksen challenged for a shot on goal, but United cleared. Dele Alli seemed to have been clattered in the first minute of the second half, but Mr Pawson saw no offence. United responded and their attack finished with a Pogba right footed shot going wide. Dele passed outside to Kane on the left. Kane�s shot was saved by De Gea but pushed upward with Lucas Moura just unable to reach the height of the ball. Spurs took the lead in the 50th minute. Trippier had sent Eriksen away down the right with a lofted and accurate ball. Eriksen cut the ball back for Dele, whose shot was deflected wide. Trippier took the corner and Harry Kane scored his first Old Trafford goal (and his second August goal!). Kane pulled away from Jones and headed beautifully into the far corner with de Gea miles from the ball. Lloris saved from Lukaku at the other end, but Spurs defended the situation well, and went 2-0 up within two minutes! Again, Trippier sent Eriksen away down the right. Again, Eriksen cut the ball back. This time it was met by Lucas Moura who fired low and beat De Gea to his right! The scenes among the Tottenham support were sensational and ecstatic! We had been 2-0 up here in April 2009 but managed to lose 5-2. We�d been 2-0 up when we did win 3-2 in September 2012. Would we hold on to our lead here? The desperate Mourinho made all three substitutions in a short space of time with Alexis Sanchez replacing Herrera; Lindelof replacing the injured Jones, and Fellaini replacing the tiring Matic. United reverted to a back four with Lindelof and Smalling in the middle flanked by Valencia and Shaw. Danny Rose fouled Pogba just outside the area after 64 minutes. Fred swung in the free kick but Lindelof hit the side netting with his header beyond the back post. At the other end Dele Alli should have taken advantage of Lindelof�s weak back pass, but Dele could not quite get his feet right and when he did get his shot in, De Gea recovered (having forced the Spurs player out once) and saved. Trippier took the corner and Kane should have scored but headed wide of the back post. Mauricio�s first substitution was Aurier for Trippier. Danny Rose was booked for another foul on Pogba. Spurs repelled the inevitable United attacks. Pochettino was going to replace Lucas Moura with Harry Winks, but changed his mind due to Rose getting a knock, so Ben Davies came on. Eriksen hit a right foot shot over the bar, before Spurs did seal with the win with their third and Lucas Moura�s second goal! The ball was cleared from defence to Kane, inside his own half. Harry sent Lucas Moura away, but the Brazilian still had plenty to do. He pushed the ball behind Smalling and Lindelof and ran through the hapless defenders before beating De Gea�s right hand with a powerful shot. There were massive hugs and cheers in the south-east corner of Old Trafford by Spurs players and fans alike! There were five minutes of added time preceded by a Sanchez free kick held by Lloris. The exodus of United fans had started before the third goal but was accelerated when we scored! The army of Spurs fans (including yours truly) stayed to salute their team, and their manager who responded in kind. It was a long and slow walk then drive out of the Theatre of Dreams and the City of Manchester, but it was worth every minute! Despite our two previous wins here in recent years, I would describe this is my favourite night in Manchester since we secured Champions League football by beating City in 2010. Spurs joined Liverpool, Chelsea and Watford at the top of the league with three wins from three games (our first three-win start since 2009-10). I will be relishing my recording of this game later today and looking forward to a top of the table clash at Watford on Sunday!